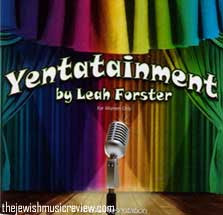 Jewish Comedienne Leah Forster has finally released her own CD. Produced and and directed by Gideon Levine CD is truly Featurs Sketches, Spoof's, and humorous songs all done by Leah The CD also features the famous Goyta Video Clip Dist. by Chazak. please can leah forster contact marion hermes on marionh100@hotmail.com re the possibility of performing for the London showcase - a variety show for women on 29th June in London.